This value package contains two 400ml bottles of Laim-Care solution. 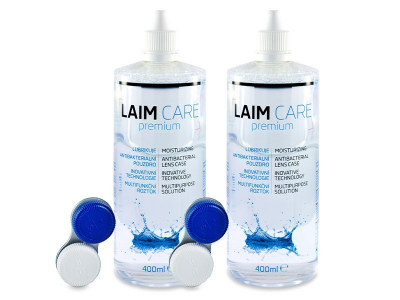 Laim-Care is a multipurpose solution for the disinfection and storage of all types of soft contact lenses. It provides effective cleaning and helps lenses stay comfortable throughout the day. Laim-Care is a multipurpose solution for cleaning, disinfecting and storing all types of soft contact lenses. Laim-Care solution contains the moisturising agent known as hyaluronic acid. Hyaluronic acid, or sodium hyaluronate, is the body's natural lubricating substance that has a similar composition to human tears. It helps moisturise contact lenses so that they remain comfortable to wear all day. It also works as an antibacterial agent. This package contains 2×400 ml bottles with two antibacterial contact lens cases included. If you wear bi-weekly or monthly lenses, stock up on on solution for your household with this money-saving package. Order arrived quickly with no hassles. Order with confidence. Bought this pkg for me an the missus, and we're both quite satisfied. I'd recommend it to anyone. Good, effective solution, and I expect this pack to last a lifetime. Very easy to order from here, and the convenience of not buying solution from the opticians is the best feature. The only solution I'm not allergic to! And I'm never without a fresh case. Great value. Good solution - feels like it is thoroughly cleaning my lenses. I've not been so satisfied with other brands. I agree--so happy I ordered the pack of 2. My husband and I go through solution far too quickly. Superb value. I'm hooked on this solution, and it's a great relief to order it in multiples. Great offer for anyone who goes through solution quickly.